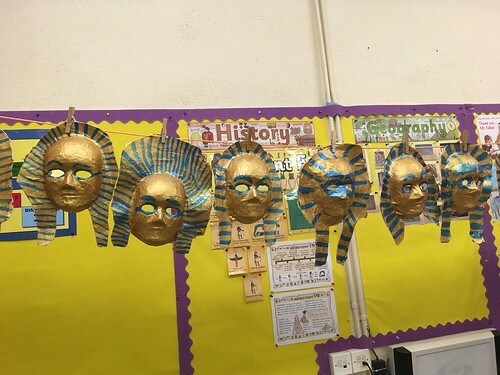 3rd class have been studying Egypt for the month of November and used the theme as the basis for their Visual Arts activities this month. 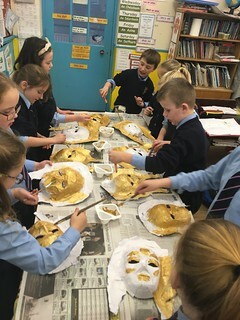 They constructed 'Tutenkhamun' masks using papier machee. 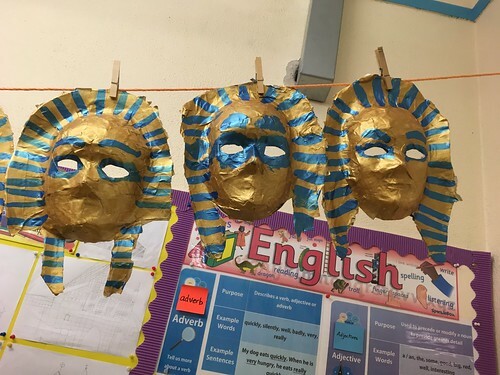 This took much time and patience as their first of all had to construct the mask, followed by three layers of paper. 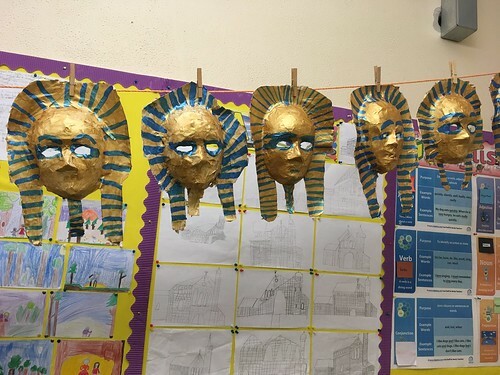 They finished off by painting a layer of gold paint, followed by putting the finishing touches with the lovely blue colour you see in the picture below. 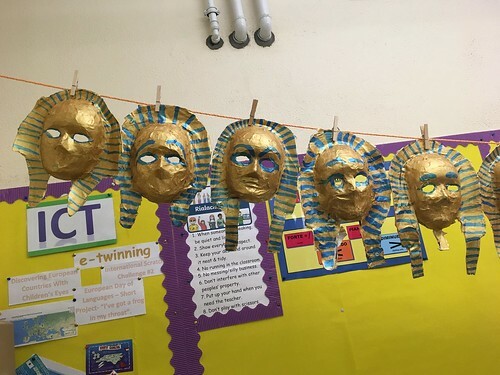 The children showed great patience and tenacity with this project. 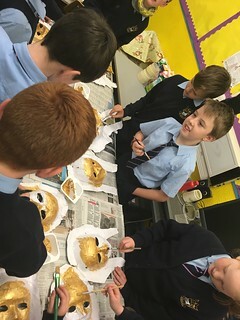 Well done Rang a trí! 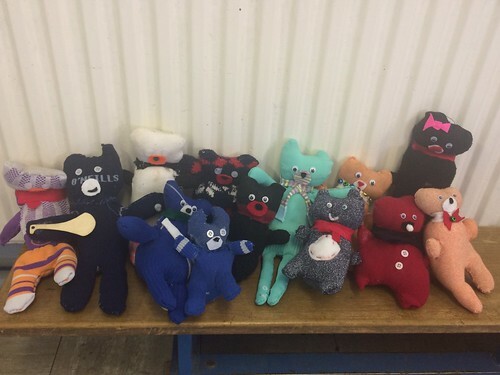 6th Class enjoyed creating their very own teddy in Fabric and Fibre in Art. 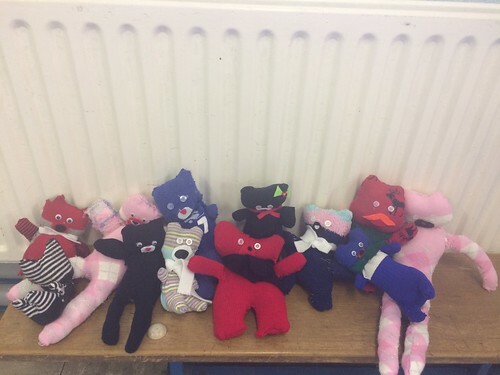 Each pupil brought in a sock. We drew an outline of arms, legs,a torso and head on the sock. The children cut out the outlines and sewed the hems with a needle and thread. We stuffed them with 'cushion stuffing'. Then we sewed each of the teddy parts together. We also stuck on eyes, buttons and other features making each one of them unique. 2. How much wood would a woodchuck chuck if a woodchuck could chuck wood? He would chuck, he would, as much as he could, if a woodchuck could chuck wood. 3. Swan swam over the sea, swim swan, swim. Swan swam back again, well swum swan. Pupils in second class used popcorn to make these wonderful cherry blossom trees. Pink paint was created by pupils using red and white paint of varying amount (different intensity of colour). Once the pink colour was created a bag of microwaved popcorn was placed in a bowl and gently stirred about. What a wonderful display of colour! Pupils made these very colourful Mother's Day cards using crepe paper and pipe cleaners.